The most surprising thing about Nigel O’Reilly is not that he looks so young (at least 10 years younger than his actual age) or that he’s creating high-end jewelry out of a small town in Mayo, but the fact that so few people have heard of him. “Yeah, I’ve kind of kept a low profile deliberately,” he laughs. But we get the feeling that’s about to change. 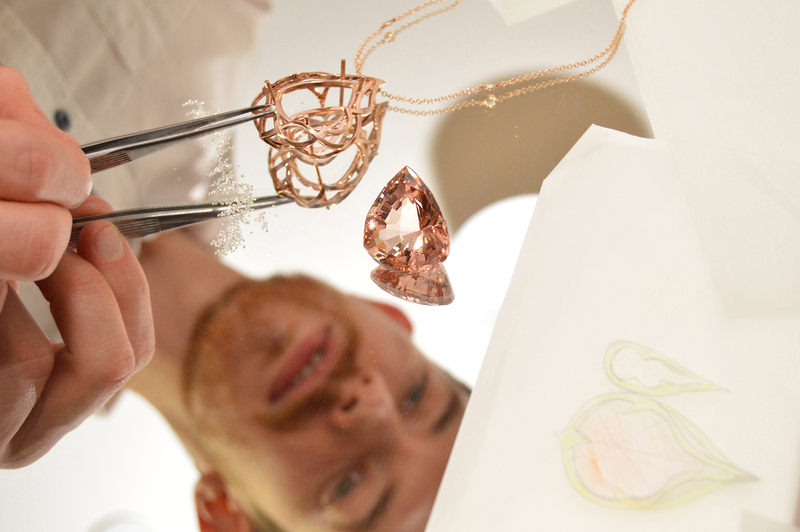 Nigel O’Reilly crafting his 69ct salmon pink morganite pendant in 18kt rose gold with diamonds. After a few years working out of his Claremorris home, O’Reilly has recently moved to a studio in nearby Castlebar, and he knows that it’s past time to start getting his name, and his work, out there. His website is a dangerous place to visit, as even the most jewelry-averse would find it hard to resist the beauty of his work. Some of the top jewelry houses on London’s Bond Street are very familiar with his work. 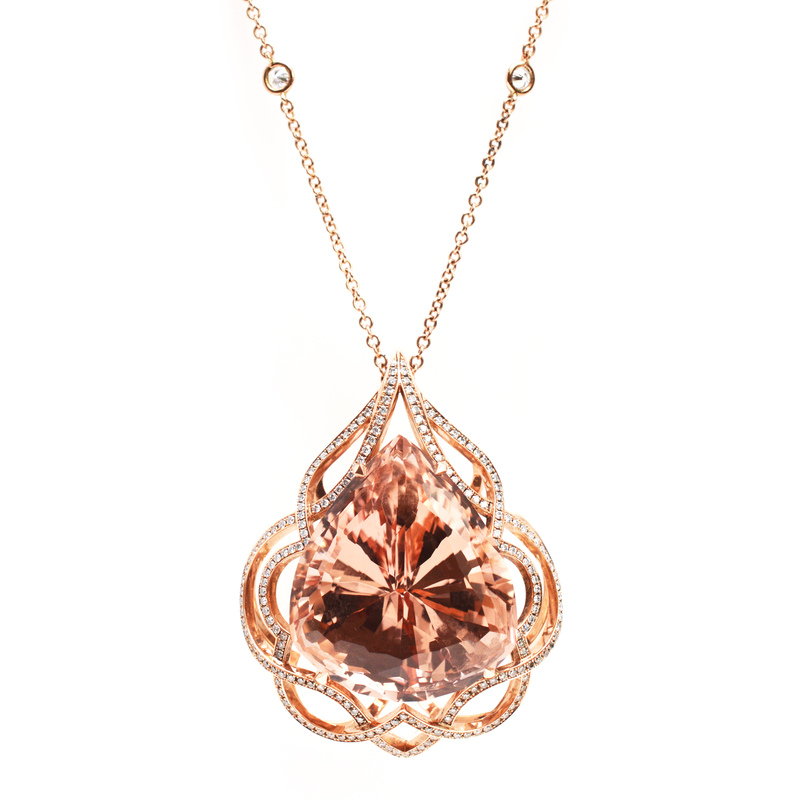 Talisman 69ct Morganite Pendant, set in a floral 18kt rose gold structure, hand set with 200 champagne & white diamonds. Earlier this summer, the accomplished goldsmith visited New York for a Mayo Foundation event, and a specially commissioned piece of his was presented to philanthropist Geraldine Kundstadter, who hosted the event at her Fifth Avenue home. Last year, he was a finalist in the Ireland’s Best Young Entrepreneur Award, having won the Mayo and Connaught regional stages. 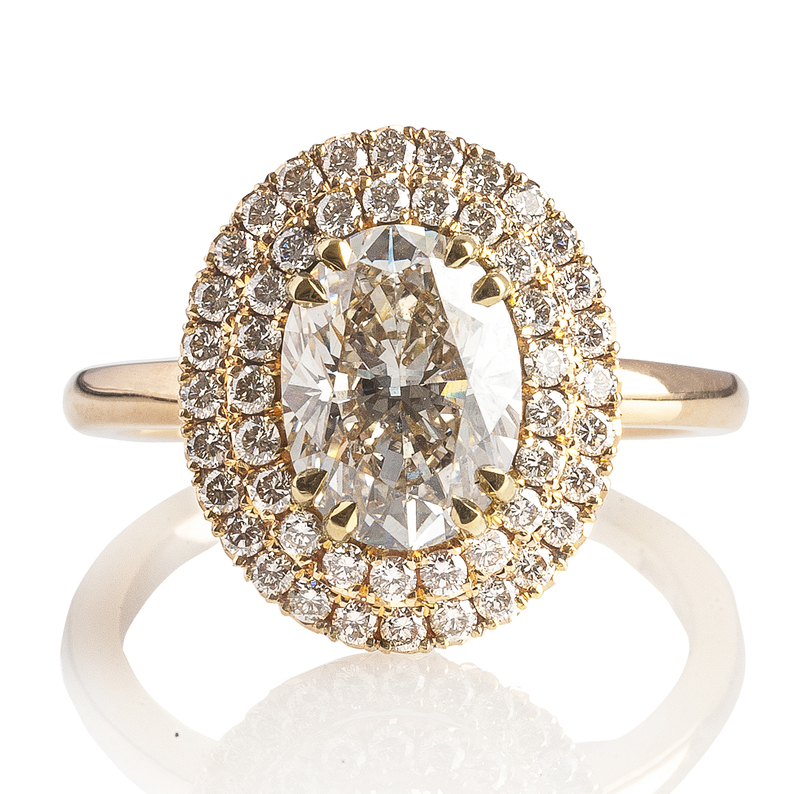 Light brown 2.21ct Diamond Double Halo in 18ct red gold. It’s all a far cry from his school days, when his severe dyslexia saw him learn to read later than his peers. His mother, a teacher, picked up on it and pushed for a diagnosis. But his parents never made it into a big deal, and he says he was never told to hide it. “Their attitude was, well this is it, but you’re good at a lot of other things,” he says. He chose a lot of practice-based subjects for his leaving cert, and after leaving school was apprenticed as a toolmaker. Using the lathe at work one day, he fashioned a ring for his then girlfriend (now wife) Tracy. She loved it, and planted the seed in his brain – should he think about making more jewelry? An intensive course in Kilkenny, the only such course in Ireland, followed, and O’Reilly’s work with elements of movement in jewelry solidified his success. He has been apprenticed to or mentored by some of the big names in jewelry – including Rudolf Heltzel and Erwin Springbunn – and lived in Stockholm and London before moving back to Mayo. 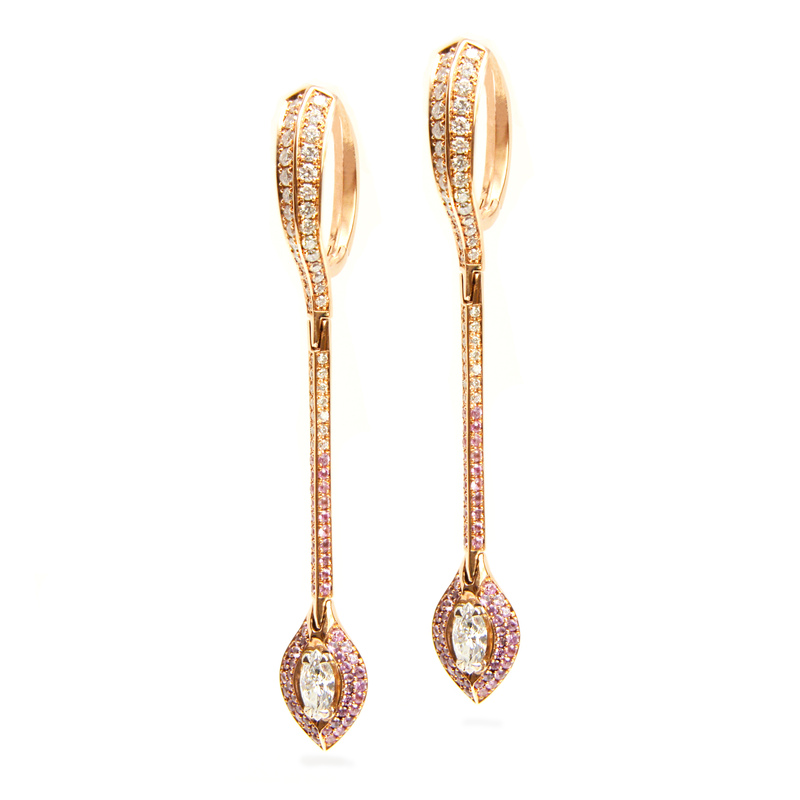 Diamond pink sapphire drop earrings in 18ct gold. Nice touch about his inspirational wife.